Book Cover for Picturing the Americas. In the first post I covered a few highlights of Crystal Bridges and the 21c Hotel, today I'll be talking about my experience at the Picturing the Americas International Symposium and my response to the work in the exhibition. I arrived early that morning to go through and see the work first hand before the symposium started. There is something about seeing a work in person that can never compare to a photo. Reproductions lose any concept of scale, color nuances and the surface quality of a work. Many of the paintings in this exhibition I was seeing for the first time and quite a few, especially the South American artists, were entirely new to me. In true art geek fashion my Moleskine sketchbook and blue Staedtler pencil never left my side, jotting down notes on color, atmosphere and foliage painting techniques. I went through the exhibition about 3-4 other times during my stay and each time marveled at something new, a small passage in a landscape I hadn't noticed or the glow of a pigment on a scene. The symposium began at 10:00am and ended around 5:00, so took up most of the day. For me the most engaging panel discussion for me was "Land, Icon, Nation," where several art historians discussed the ways artists in the exhibition helped construct national and even regional identities. Edward J. Sullivan, a professor of art history at New York University, had a fascinating and lively discussion about the Carribean landscape that made several very interesting points in relation to Caribbean culture and also the language of trees. Overall I enjoyed hearing about work discussed in a historical light, outside of art school its far too ofen that my only interaction with the history of art is either in books or a static museum setting. Seeing the excitement and energy of the people studying the work in the exhibition helped breathe more life into the paintings. Below are some of my personal favorites and highlights of the Picturing the Americas Exhibition. One of the paintings I was most excited to see was Asher B. Durand's Kindred Spirits. 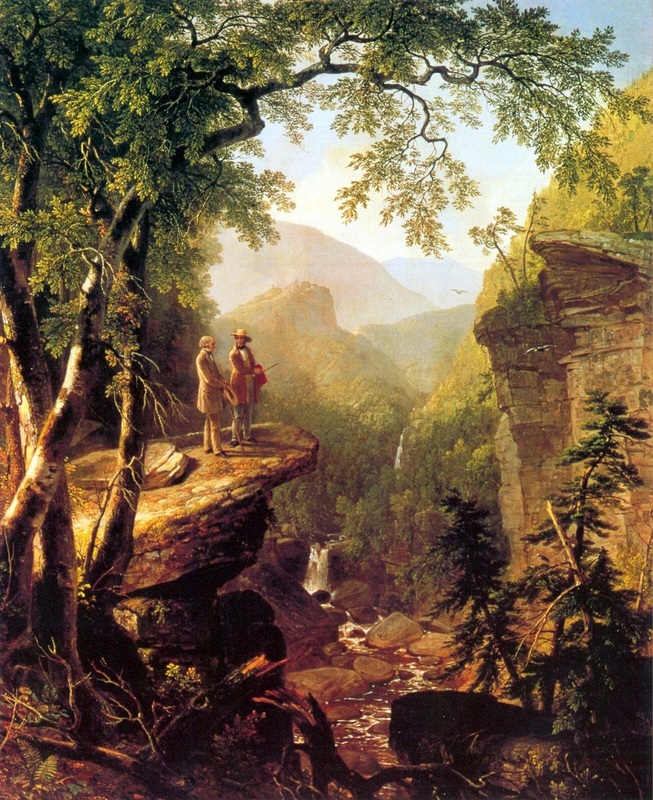 Durand has always been one of my favorite Hudson River School painters, but more for his drawings and studies than anything else. Not that his paintings are bad, I just have more of an affinity for the quality of line in his drawings. I wasn't interested in Kindred Spirits for the technique as much as I was curious to learn more about the way he constructed his composition. The painting is idealized, made up of multiple places and perspectives that embodied the character of the Catskill Mountains. I work in a similar fashion by combining several images of one or more places into a single image, albeit this multiplicity of viewpoints is a bit more evident (intentionally so) in my drawings. Seeing this painting in person was one of the major highlights of my trip. Martin Johnson Heade, Two Hummingbirds with an Orchid, 1875. I got to see plenty of work from Martin Johnson Heade including multiple paintings in the museum's main collection. The thing that most impresses me about his work is the ability to build up a sense of thickness in the trees and receding space. It's almost as if you can feel heaviness of the humid, tropical air when looking at his work. Speaking of atmospheric perspective above are two detail shots from paintings done in 1868. 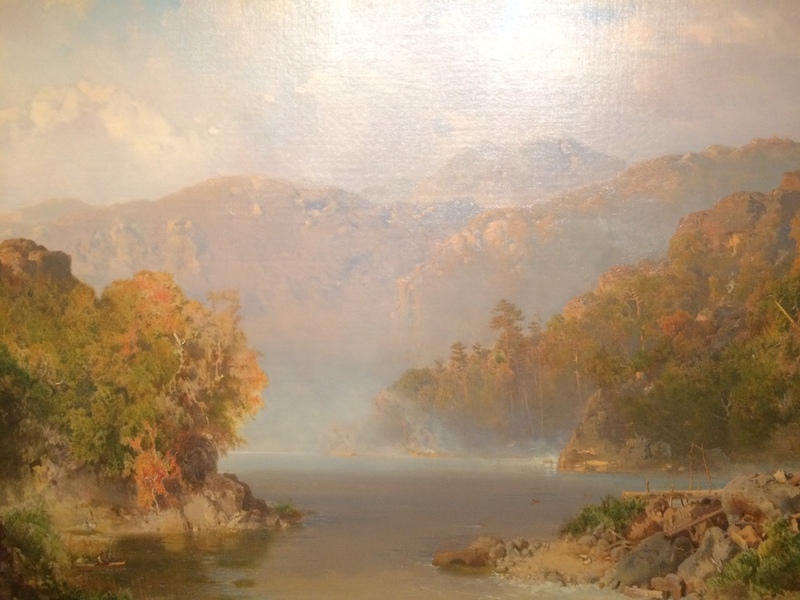 The one on the left is by Otto Reinhold Jacobi, titled Morning on the Upper Ottowa. This was a part of a painting that was just spectacular in person. The way he used subtle but effective color shifts from warm to cool, the softness in the blues, dusks and warm neutrals is simply perfection. 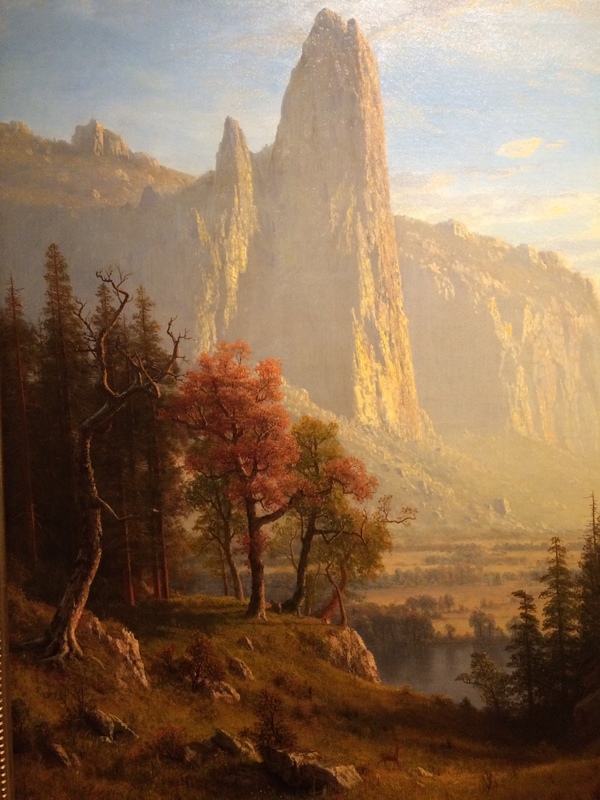 On the right is an Albert Bierstadt painting of Yosemite Valley. Instead of softness like Jacobi, there is a bit more crispness and warmth to the way Bierstadt has rendered the landscape. Both of them achieve a nice diffused glow and unity through the use of atmosphere and painted them in similar ways, but with drastically different results. These are things that are hard to pick up on when viewing reproductions of work and I thoroughly enjoyed dissecting these nuances in person. Eugenio Landesio and Jose Maria Velasco, Hacienda de Monte Blanco, 1879. Eugenio Landesio,"El Valle de Mexico desde el cerro de Tenayo (The Vallery of Mexico Seen from the Tenayo Hill), 1870. I also discovered a new painter, Eugenio Landesio, and was immediately struck by the way he handled painting clouds. After traveling to the Carribean this fall and seeing the towering plumes of afternoon storms first hand, I was especially drawn in to these pieces. Landesio uses a blush pinks, royal blues and warm greens to full effect in both works, showcasing how these colors could creates such a stunning atmospheric effect. The last two works are based on industry, the Paul Weingartner painting is about rain forest deforestation and Charles Sheeler's is a celebration of industry. Each are powerful reminder of the ways we change the landscape and use natural resources, which is why I was drawn to them both. Overall I really enjoyed the exhibit and it linked up perfectly with the other Hudson River School landscapes the museum houses in its main collection. Pedro Weingartner, A Derrubada (The Fell), 1913. Note: Unless otherwise noted all photos were taken by me at the exhibition.